Shawnee State Forest, photo taken from the summit of the Copperhead Lookout Fire Tower, last Sunday. If you've tagged along with this blog much, or for very long, you'll likely have noticed that I spend a fair bit of time in southern Ohio's Shawnee State Forest. There's a good reason that I'm drawn to the area. Shawnee harbors some of the richest biodiversity to be found anywhere in the Midwest, and roaming its 65,000 acres is always rewarding. 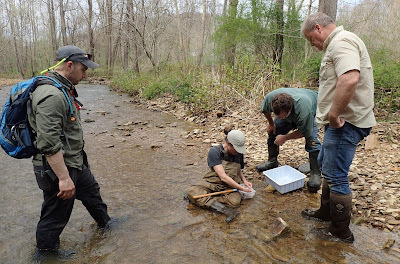 Add in the sprawling Edge of Appalachia preserve and its 15,000 acres - a stone's throw to the west - and we've got a massive wilderness full of diverse flora and fauna. I will heartily recommend a great way to learn about this region, whether you are a first timer or have made many visits: Flora-Quest. Now in its sixth year, "F-Q" takes place from May 4th thru 6th, and is centered at the wonderful Shawnee Lodge and Conference Center smack in the middle of the forest. Redbud, Cercis canadensis. A common treelet in Shawnee, and the host plant for the magnificent Henry's elfin butterfly. The primary focus of Flora-Quest is guided excursions into the field, accompanied by some of the best botanists/naturalists to be found in this part of the world. Keeping company with knowledgeable guides is useful for several reasons. One, Shawnee and the neighboring Edge of Appalachia are so vast that it's hard for the uninitiated to figure out where the best hotspots are. The guides know. Also, if you really want to learn more about plants, there is no better way to do it than to spend time with someone who is a veritable walking encyclopedia of botanical knowledge. The guide roster really is a Who's Who: CLICK HERE to see who they are. Trailing arbutus, Epigaea repens, a trailing member of the heath family and one of our first wildflowers to bloom. There are interesting lectures as well, in the comfort of the lodge's capacious conference room. This year, Guy Denny and Martin McAllister headline Flora-Quest, and few people know this area like they do. Read more about them HERE. A true star of spring, the fire pink, Silene virginica. This stunner always stops everyone in their tracks. While plant diversity abounds, the fauna just cannot be ignored. Over 100 species of breeding birds can be found in Shawnee and vicinity, including more warblers than you can shake a stick at. Chances are you'll hear Cerulean Warblers serenading you from your lodge room's balcony, and Hooded, Worm-eating, Kentucky, Blue-winged, and Black-and-white warblers are a dime a dozen. And that's just the tip of the iceberg. Butterflies are outrageously abundant, and you can expect to see thirty species or more. 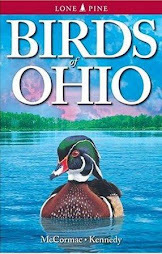 One of the guides, all the way from Florida, is Jaret Daniels, author of the Butterflies of Ohio and a stellar field man. He knows plants, too! Long-spurred violet, Viola rostrata, one of our most striking species of violets. Its growth habit is such that the plants appear to be elfin shrubs. This species, along with the MANY other species of violets in Shawnee, are host plants for the plentiful great spangled fritillary butterflies. If you are interested in learning to sort out seemingly tricky groups like the violets, your guides can help. Try and stump 'em if you can! If you are more casual in your interests, that's fine, too. Whatever the case, you'll want to bring your camera, especially for the lady's-slipper orchids! Goldenstar, Erythronium rostratum, one of the rarest plants in Ohio. This gorgeous lily will be past by the time of Flora-Quest, but there will be a whole new cast of rare plants that will have taken its place. That's one of the allures of exploring this area - the incredible number of very rare species that can be found. We get all too few precious springs over the course of our lives, and not a one should be wasted. Sign on to Flora-Quest before all the spaces are filled. It'll be a fantastic experience, I'll guarantee it. CLICK HERE for registration information. 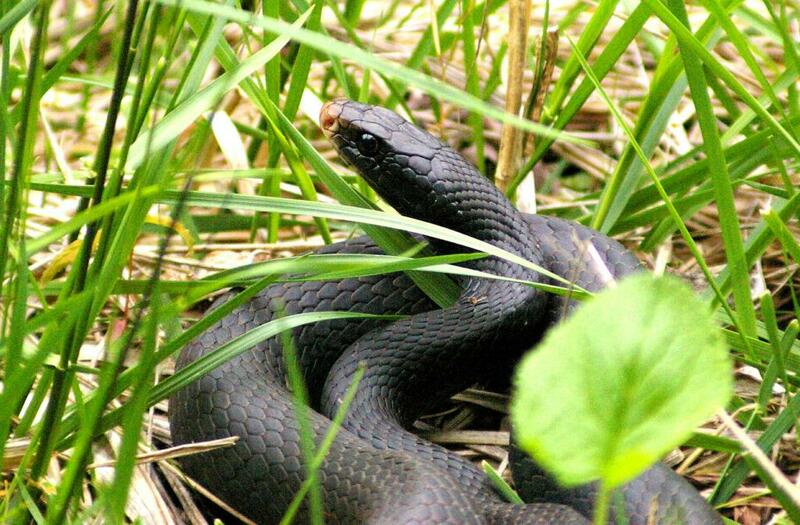 A black racer, Coluber constrictor, rears up to investigate the photographer. While exploring remote roads in Shawnee State Forest last Sunday, I was cruising down a lane when, out of the corner of my eye, I spied a serpentine shape rise from the roadside grass. Racer! I whacked the brakes and tossed the car to the roadside. Leaping from the vehicle, I ran back to the spot where I had seen the snake. There was no longer a snake in the grass, but I quickly heard a rustling of leaves on the steep wooded slope on the other side of the road. Somehow that racer had shot across the road and twenty feet up the hill in a matter of seconds. Such speed isn't that surprising if you're familiar with these scaley beasts. None of our snakes move with such rapidity, and a racer at full slither is an impressive sight. I shot up the hill after the snake, in the hopes of getting photos. It was an impressive specimen; certainly over four feet in length. The snake was well aware of me, and flashed off through the understory towards a pile of downed branches. I was thinking I might get near enough to grab its tail and try to manipulate the animal out to where I could make some photos. Wasn't to be - he gave me some great looks and a fun chase, but the snake beat me to the wood pile and vanished. 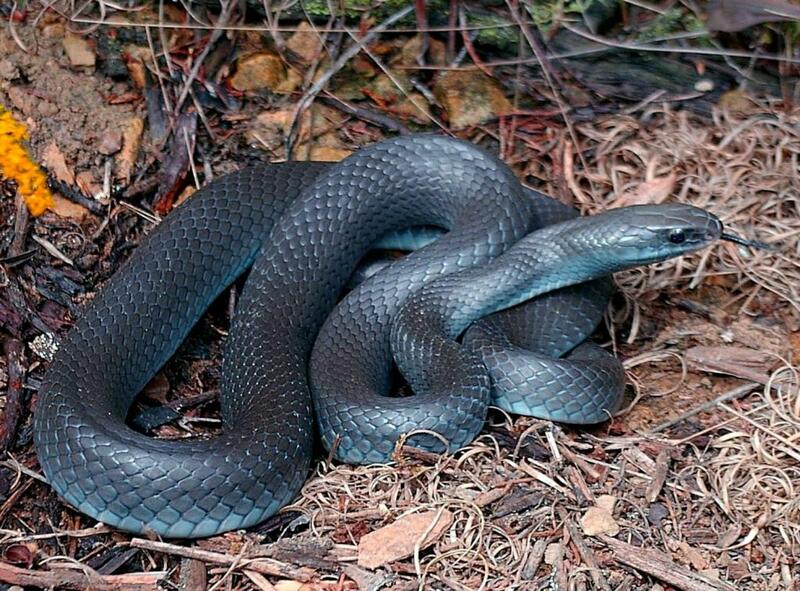 The beautiful specimen in John Howard's excellent photo shows a steely-blue wash on the sides and belly. 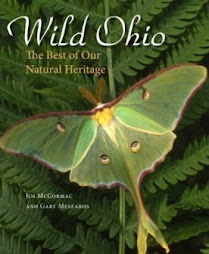 John took this photo and the preceding one in Adams County, not far from where I encountered my racer in Scioto County. Black racers occur in southern and eastern Ohio, and north and west of their range, the so-called blue racer, Colubris constrictor foxi, is found. These weakly defined subspecies apparently intergrade where their ranges overlap. Racers on the move electrify their surroundings. They, to me, are like the herpetological counterpart to Accipiter hawks such as the Cooper's and Sharp-shinned. Racers are fast, agile, and hyper alert. I can only imagine that potential prey items freeze in terror when one of these snakes is in the area. Many species of snakes freeze and hunker down when a person comes into their presence, or the animal will dart into a cranny if one is close at hand. Not so the racer, necessarily. A curious racer will often rear its head and upper body well off the ground, cobralike, to better inspect the offending party. And when it decides to split the scene, whoa! These things move like you wouldn't believe. I once surprised one that was sunning on a steep hillside, and it fled downhill. With the advantage of the slope, that snake seemed like it hit 20 mph and was gone in a wink (their top speed is claimed to be about 10 mph. That would be a very fast running pace for a human). Harmless as they are, racers can be aggressive. I'm sure that if I had managed to tug its tail, my racer of last Sunday would have given me a good bite for my troubles. Several times I've heard tales from people who have apparently ventured into the proximity of a racer nest with eggs. The racer first vibrates its tail loudly in the leaf litter, invoking thoughts of a rattlesnake. My friends claimed that the apparently protective racers they encountered reared their head and upper body well off the ground, and advanced towards them. These are good-sized snakes - up to five feet - and even though the people that I have heard such stories from were snake people, they admitted that the snakes were rather intimidating. I don't know if racers really guard their nests, or if these folks just caught their snakes on a bad day, but those encounters do make for good stories. I've never had a racer face off with me, but I guess it doesn't surprise me that one of these edgy high-strung reptiles would stand its ground with a person. While a black racer might be the stuff of an ophidiophobe's nightmares, they are in the final analysis exciting, beautiful animals who play an important part in the habitats in which they live. Encountering a racer is always a treat. Thanks to John Howard for letting me use his wonderful images. One of these days I'll get one of these serpent speedsters in my lens, with luck. I saw an email today from Bill Hilton in South Carolina, reporting his first Ruby-throated Hummingbird of the year from Hilton Pond. This bird was one day later than Bill's earliest record, and pretty much right on schedule for that part of the country. Bill, by the way, is one of the country's premier hummingbird researchers, and you should check out his wonderful website HERE. This prompted me to check the eBird data chest to see their map of the hummers' northward progression. 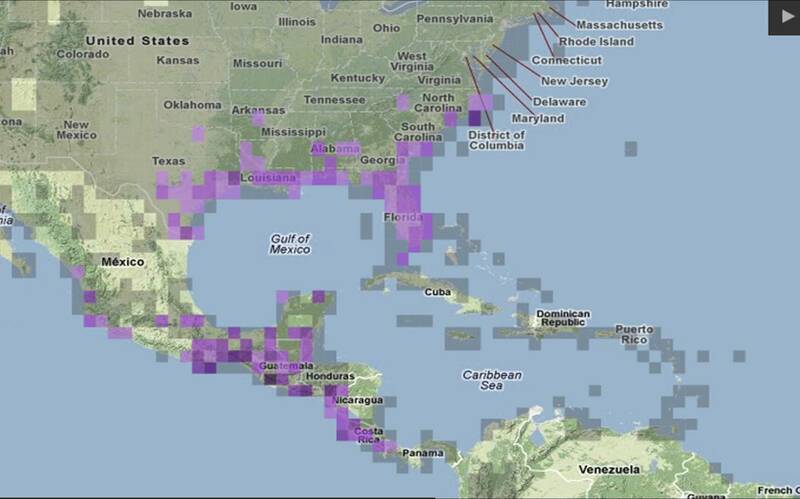 Here it is, showing hummingbirds starting to penetrate to the latitude of Tennessee, with one southern Indiana record. Still a ways from Ohio, although we did have one credible report from an experienced observer a few days ago. Insofar as I am aware, that would best the previous early Ohio record by over two weeks. I do think hummers may appear here a bit earlier than normal, and we should start to see some more reports within ten days or so. You may recall that I recently blogged about a site that annually posts a hummingbird migration map, HERE. I expressed incredulity over that map's spate of northern records (CLICK HERE for their latest map), and I remain quite skeptical of hummingbirds.net's map. Since then, someone sent me another website's hummingbird migration map, HERE. It also has plenty of groundbreaking records. These maps have drawn plenty of skepticism, and commentors responding to the skeptics seem to fall into two camps: 1) those of us who doubt the maps/records are saying that the reporters who contributed the maps' records are liars; or 2) eBird reporters and other observers just must not be finding these early hummingbirds. I don't believe either of those answers is correct. I believe that all, or nearly all, of the weeks-early northern records that makes up those non-eBird maps are cases of misidentifications. Our exceptionally warm late winter and spring has seen a very early emergence of large insects that normally would not yet be on the wing, such as carpenter bees, green darner dragonflies, and various big sphinx moths. And believe me, people can and do mistake these large bugs for hummingbirds. If someone does spot an honest to goodness hummmingbird that is weeks early, they should try to document its identity to ensure it isn't one of the potential vagrant non-Ruby-throated species. There is nothing wrong with questioning the out-of-the-ordinary, and wanting to see solid evidence for significant new trends, such as hummingbirds appearing weeks earlier than they've ever been reported. 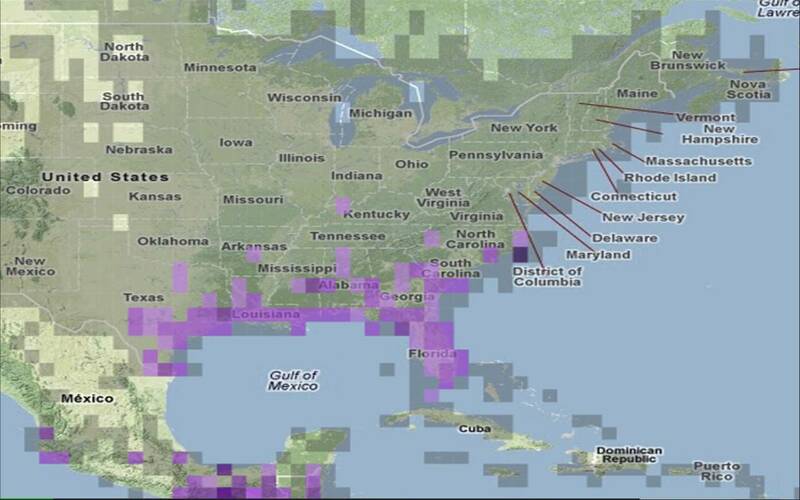 Anyway, the eBird map draws on carefully vetted records and is reliable. I think it provides us with an accurate picture of this spring's hummingbird migration thus far. Great Blue Heron rookery, southern Delaware County, Ohio. I made this image on March 20, 2011. Doral Chenoweth, photographer/videographer with the Columbus Dispatch, made a neat little video of the Great Blue Heron nesting colony pictured above. He tapped your blogger for the voice-over, and did a great job of assembling the piece. CLICK HERE to watch the vid. This rookery is easily seen from Taggart Road on the east side of the Olentangy River, just south of Hyatts Road, in Delaware County. Four times in the last week, people have asked me to identify a particular weed. By the third time, I knew the answer before seeing the plant. So, I figured I would share the plant here, because there are certainly others who are wondering about this little botanical invader and maybe this post will help. When today's email, with photos, came in, I decided I had better make a few images of the offending plant of my own. So I waltzed on out the door of my office building and into this slightly weedy flowerbed twenty feet away. Within seconds, I had found examples of the weed du jour: hairy bittercress, Cardamine hirsuta. It's not a big thing - the little basal rosette of leaves isn't even as big around as your palm, and the flowering stems only rise six inches or so. While not on the size scale of kudzu or bush honeysuckle, hairy bittercress can be prolific and sometimes dominates yards and gardens. Thus, it becomes offensive to those who wish a manicured landscape. Hairy bittercress is a member of the mustard family (Brassicaceae), and some of the mustards are quite adept at being weedy. Indeed, members of this family may be among the first plants to jump the garden fence and establish themselves as weeds back in the Old World. This plant, like so many others in our nonnative weed flora, are of Eurasian origin, and have long been adapted to landscapes highly disturbed by people. When hairy bittercress and others of its ilk made their way to the New World, they found a ready niche in our disturbed habitats - like your yard, or flowerbed. This species is a winter annual, and those little rosettes of leaves are often evident from late fall on through the winter. This growth habit enables the plants to pop forth early in the spring, and burst into flower and fruit with vigor before most other plants have reached the reproductive stage. Tiny white flowers are borne at the summit of stems that support only a few cauline (stem) leaves. The leaves are pinnately dissected, meaning the leaf is divided into smaller segments that branch from either side. This is a typical hairy bittercress flowering stem, showing flowers and fruit at the summit, and two cauline leaves adorning a largely naked stem. Close inspection would reveal scattered hairs on the leaves, especially around their bases, which helps distinguish this species from one or two similar but non-invasive species. The tubular pods that project nearly straight upwards are the fruit, which are termed siliques in mustard-speak. Hairy bittercress is a prolific fruiter, and each silique contains many tiny seeds. One plant can carpet bomb its immediate environment with its embryonic spawn. These seeds seem to have a high rate of fertility, thus a few plants can quickly turn into many. Hairy bittercress has been around ever since I began botanical field work around 1990. But it surely has become much more abundant since then. The first Franklin County, Ohio collection dates to 1898, but back then it would have been a seldom-seen oddity. By 1991, the mustard had been collected in at least 29 Ohio counties, but definitely was scarcer than today, and I'm confident that it is easily found now in all 88 of our counties. No one collected this plant in Michigan until 1976, but I'm sure it isn't hard to find up there now. Why is hairy bittercress becoming so prolific? In a word, nurseries. Many of the first collections in the "wild" come from greenhouses and nurseries, where hairy bittercress would pop up as a weed. Such a growing environment sets the stage for an eventual massive escape. The tiny, prolific seeds easily adhere to feet, digging implements, and anything else they come into contact with. Thus, the soil that nursery stock is planted and transported in eventually becomes infested with hairy bittercress seed. As localized infestations become more severe, the plants are more easily spread, not only in the local yardscape but also to new sites. Before long a giant mustardish snowball is rolling downhill and out of control, casting seeds far and wide. And now, we are at the point where there is such a proliferation of hairy bittercress that nearly everyone notices the plants. Fortunately, because of their diminutive stature and propensity for growing in open, already highly disturbed environments, Cardamine hirsuta does not cause much harm to most natural areas. That's not to say that it can't; infestation of a habitat SUCH AS THIS could be very bad for some of our highly specialized native mustards. I'm afraid hairy bittercress will be the bane of many a gardener for some time to come. Last night was plenty warm and lots of wet, so I headed over to a favorite amphibian hotspot not far west of Columbus. Lots of animals were on the prowl, moving overland to breeding pools. In just two hours, and covering only a short stretch of road, I saw scores of frogs and toads, and a surprising number of Ambystoma salamanders. Sorry for the smudgy spots on some photos - they're caused by rain drops on my lens. Try as I might, it was impossible to keep the camera totally dry. It was truly a dark and stormy night, after all. A male spring peeper, Pseudacris crucifer, makes himself known. Scores of the quarter-sized amphibious blowhards were singing in this vernal pool, and the shrill high-pitched peeps are nearly ear-splitting when one is up close and personal. From my experience, the best way to study frogs is to get in the pools with them at night when they are vocalizing. A young American bullfrog, Lithobates catesbeianus, hops his way across the road. On a good migratory night, such as last evening, it is truly astonishing how many frogs of multiple species can be seen on the roads. Most of the lanes that I explored last night are lightly traveled country roads, but even so the mortality from vehicles is high. A big old green frog, Lithobates clamitans. A smudge of rain partially obscures its tympanum, or "ear" - just aft of the eye. In females, the tympanum is about the same size as the eye; in males it is noticeably larger. This one looks to be a female. There were a lot of American toads, Anaxyrus americanus, moving last night. Many were in full song, their sonorous droning trills echoing from the wetlands. This little toad stretched up, the better to see the annoying paparrazi who was flashing him in the face. "Enough", says the warty little fellow! I was surprised to see how many salamanders were still moving. Given the extended warm weather that we've had, coupled with plenty of rainy nights, I figured they would pretty well be done for the year. But in short order, I saw a few dozen spotted salamanders, Ambystoma maculatum. The road that I spent most of my time on is buffered by wet woods full of vernal pools on either side, and plenty of salamanders were crossing back and forth. I'm sure I saw but a small percentage of the animals that were moving last night. Outnumbering the spotted salamanders were the bizarre "unisexual" salamanders. These animals are part of a hybrid swarm: a complex of all females that have genetic contributions from small-mouthed, Jefferson, blue-spotted, and tiger salamanders. Should you be interested in learning more about these amphibious oddities, CLICK HERE. A heavily blue-flecked individual makes its way across the road. Presumably this patterning is the result of its blue-spotted salamander lineage. Its tail also caught my eye. It seemed exceptionally thick and compressed, and reminded me of the shape of a tiger salamander's tail. There are plenty of tiger salamanders in this area, but I don't know how much of a role they play in forming the local populations of unisexual salamanders. The annual spring run of amphibians to the breeding wetlands is one of spring's great natural events. This was probably one of the last good migration nights around here, and likely the last night of the year that I was able to get out and look. Another year will have to pass before I get to observe this phenomenon again. Hummingbirds: early to return, or not? A gorgeous male Ruby-throated Hummingbird, Archilochus colubris, held by Bill Hilton. Bill caught this bird on April 28, 2010 in West Virginia at a banding demonstration for attendees of the New River Birding & Nature Festival. Its arrival in West Virginia was right on schedule. Male Ruby-throated Hummingbirds show up in this region around mid to late April, preceding the arrival of the females by eight days or so. A friend forwarded me this map today, from the website http://hummingbirds.net/ Judging by all of the records on this map, there are plenty of contributors providing their hummingbird sightings, and the map purports to show the phenology, or timing, of hummingbird migration as the birds move north in their seasonal occupation of eastern North America. But WAIT! I know it’s been an exceptionally warm spring, and some flora and fauna are well advanced beyond what would be the case in a “normal” year, but WOW! The map shows hummingbirds as far north as central New York, Michigan, and Wisconsin! Numerous records are sprinkled throughout the Upper Midwest, including Ohio. The map invites incredulity. I have not heard of a single credible Ruby-throated Hummingbird report from Ohio as yet, and I try to keep my ear to the wall. 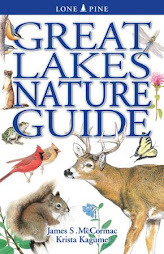 The first Ruby-throats appear in the Buckeye State in the third week of April (exceptionally early records from around April 10), but they don’t become widespread and frequent until early May. That timing holds true for other states at this latitude, and it takes a bit longer for the birds to reach more northerly haunts. While I have issues with the map above, I do want to say that the hummingbirds.net site is quite well done and does feature lots of good hummingbird information. I suspect that the records that comprise the hummingbird migration map are accepted from contributors at face value and plotted with no attempt to verify the record. I don’t want to come off as some sort of hummingbird scrooge, but extraordinary claims that contradict what it is known about the biology of a well-studied species should have solid evidence as backing. This map is courtesy of eBird, and reflects Ruby-throated Hummingbird data that has been submitted as of today. The darker the purple, the greater the number of individuals that were reported. The eBird map shows just about what we would expect to see at this time – Ruby-throated Hummingbirds just beginning their spring infiltration of the United States, with nearly all reports from the Gulf States or lower Atlantic Coastal Plain region. Most Ruby-throated Hummingbirds winter in southern Mexico and Central America, and make the 500+ mile open water crossing of the Gulf of Mexico on their northward journey. So why the huge disparity between the eBird map and the hummingbirds.net map (keeping in mind that eBird probably has far more contributors)? Well, Project eBird is quite diligent about reviewing data before publishing it. The project employs a small army of expert birders who vet unusual sightings – such as a mid-March hummingbird in the Upper Midwest – and if details are insufficient, the sighting does not appear in the literature. In short, eBird data is well reviewed and scientifically credible. Documentation of the arrival of Ruby-throated Hummingbirds in spring in North America, and their subsequent progression northward, has been well described over a long period of time. The hummingbirds.net map has them arriving in many places a month or more ahead of schedule. Fact, or fiction? And if the data is fiction, what could account for such a spate of misidentifications? Birds are not normally confused with insects, but in the case of certain big sphinx moths, it happens quite frequently. 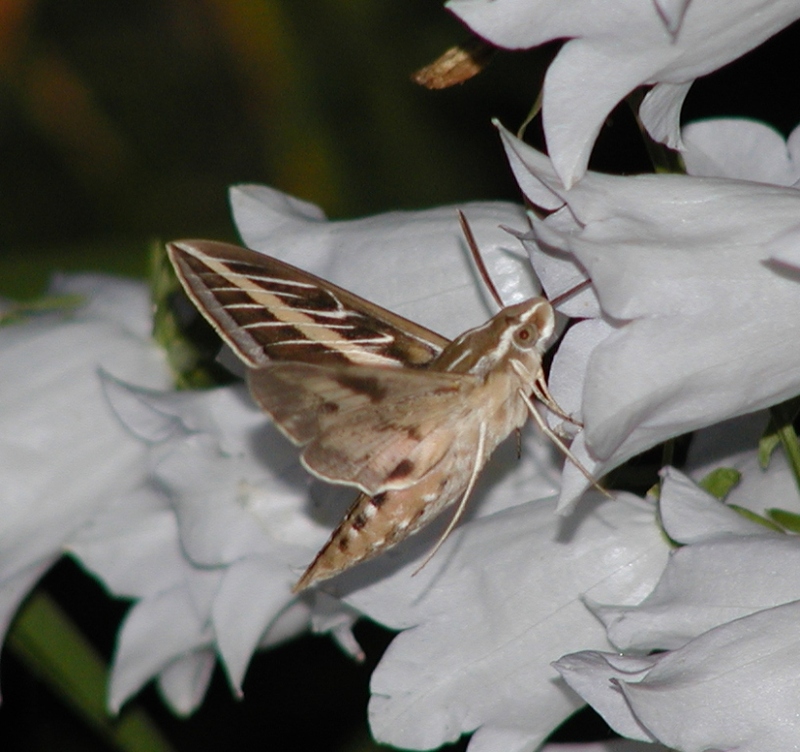 This is a white-lined sphinx, Hyles lineata, which appears astonishingly hummingbirdlike. Some refer to the so-called hummingbird moths as “hummingbird mimics”, but their resemblance may actually be an example of convergent evolution. 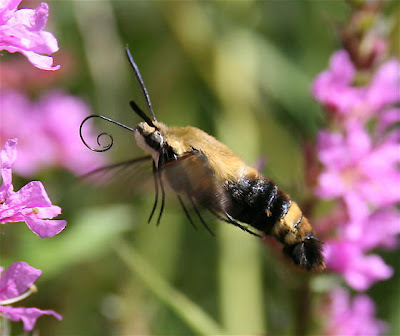 An amazing photo of a snowberry clearwing, Hemaris diffinis. The sphinx moths in the genus Hemaris resemble hummingbirds to an incredible degree. Many a person has been fooled by these day-flying moths, and upon seeing one, some might swear that a hummer just shot by. This is a hummingbird clearwing, Hemaris thysbe, and it is probably the champion of hummingbird lookalikes. These moths hover before flowers, extracting nectar with their long tongues. Their wings beat so rapidly as to be just a blur, and they aren’t much smaller than a Ruby-throated Hummingbird. To top off the illusion of a hummer, Hemaris moths even produce an audible buzzing with their wings, as do the birds. 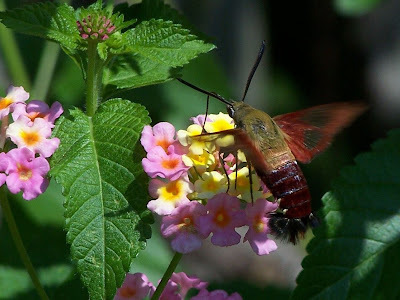 Both the hummingbird clearwing and snowberry clearwing are common, widely distributed species throughout eastern North America, as are a few other sphinx moth species that resemble hummingbirds, albeit to a lesser degree. If one of these moths buzzes by, and good looks are not had, and the observer is not all that experienced, they can and do get reported as hummingbirds. Members of the honeysuckle family, such as this arrowwood viburnum, Viburnum dentatum, are the host plants for Hemaris hummingbird moths. This is the caterpillar of a snowberry clearwing. The adult moths lay eggs on suitable honeysuckle family hosts, which eventually hatch these cool-looking caterpillars. The cats then feed and grow, molting through several instars before reaching maturity. Once a hummingbird moth caterpillar is fully mature, it drops from its host plant into the leaf litter below. Ensconced in the leaves, it transforms to its pupal stage, as seen above. The Hemaris hummingbird moths pass the winter in the pupal stage, and warming spring weather triggers their transformation from this penultimate stage to the beautiful winged adults. Ruby-throated Hummingbirds should not be influenced to arrive in the United States any earlier than normal because of our unseasonably warm weather. Most of the hummers are 1,500 - 2,000 miles away – how are they going to know that it’s been balmy and spring is ahead of schedule up here? The impulse for Neotropical birds to begin migration is triggered by photoperiod - changes in daylight length - and possibly other environmental cues. 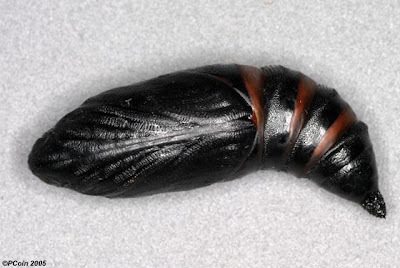 On the other hand, moth pupae overwintering in leaf litter could, and probably would, mature earlier than normal in the presence of unusually warm temperatures. Hemaris moths normally emerge in March in the southern U.S., and can be on the wing in April in the northern U.S. The well above average temperatures of late winter and early spring have likely prodded the moths to rise early from their winter slumber, and eager hummingbird seekers may be mistaking them for their wished-for feathered harbingers-of-spring. At least that’s one theory to explain the hummingbird.net map. Another might be that most or all of those hyper-early hummingbird reports pertain to vagrant western species, such as Rufous Hummingbirds, which do have a penchant for appearing outside the windows of normal Ruby-throated Hummingbird passages. An ever-increasing number of non-Ruby-throated Hummingbirds winter in the Gulf coastal states. I can’t buy that, though – there is no precedent for a sweeping vernal invasion of scores of non-Ruby-throated hummingbirds in the eastern U.S. Yet a third theory might be that these reports represent Ruby-throated Hummingbirds that overwintered in the southernmost U.S., as a small number of birds do. Perhaps these hummers might be compelled to begin migration earlier, as they could possibly somehow be better tuned in to climatic factors in the northern reaches of their breeding range. That would mean that they are either overriding the built-in photoperiod response that stimulates physiological changes and induces migration, or somehow the mild winter altered their brains' interpretation of the normal cues that instigate migratory behavior. As far as I know, there would be no precedent for this. This is hummingbirds.net’s map from 2011. Everything looks just about spot-on in regards to timing, although I would question the northernmost red dots, which indicate March sightings. We may indeed set some legitimate early records for returning Ruby-throated Hummingbirds in Ohio and other northern states. The abundance of prematurely early flowering plants may speed them along their way as they advance northward from the Gulf States. But I don’t believe that we’ve had hummers up here yet, and in the absence of concrete evidence, I certainly can’t accept the map at the beginning of this blog. It seems more likely it charts the emergence of clearwing hummingbird moths than the northward sweep of Ruby-throated Hummingbirds. Last Saturday, I made an extended foray into the depths of Adams County in southernmost Ohio. My primary mission: wildflowers. As the days become longer, the increasing sunlight gradually warms the woodland soil until a critical mass is reached. When the humus reaches a suitable temperature, the woodland wildflowers begin their eruption. For many, me possibly included, the explosion of a staggering diversity of spring wildflowers marks one of the great passages of the seasons. It is a spectacle not to be missed. Spring has indisputably sprung early this year, and I was astonished by the numbers and variety of plants that were already in full bloom. Following are some of the botanical objets de' art. A woody harbinger of spring, the pale lemony blossoms of spicebush, Lindera benzoin, were out in profusion. Later, after leafout, beautiful spicebush swallowtail butterflies will deposit tiny jeweled eggs on their namesake plant's' foliage, which in turn will hatch curious snakelike caterpillars. Cut-leaved toothwort, Cardamine concatenata, one of many vernal mustards. As with the others in its Brassicaceous tribe, the flowers have four petals. Another mustard of spring is the delicate little purple cress, Cardamine douglassii. Its flowers are tinged with an oh so subtle hue of lavender. They don't come much more fragile and ephemeral than this, the yellow harlequin, Corydalis flavula. It's blue-green dissected foliage may remind you of its close ally, the Dutchman's-breeches. A stunning spike of dwarf larkspur, Delphinium tricorne, beautifies an old stump. Larkspurs are members of the buttercup family, and like many of their kind are quite poisonous. Perhaps taking the award for elfin beauty is the impossibly tiny harbinger-of-spring, Erigenia bulbosa. A big one towers only a few inches skyward, and they sometimes barely manage to squeak past the litter of leaves on the forest floor. This one is a member of the parsley family, as you may have guessed by the foliage. Lilies are perennial crowd-pleasers and white trout lily, Erythronium albidum, is no exception. Their pale ghostly blossoms are true works of art by any measure. A botanical extrovert, the glaring showy face of one of our few native poppies, bloodroot, Sanguinaria canadensis, beams forth. It almost seems a shame that these exquisite flowers last but a day. A small bloodroot colony, their naked stems enwrapped by the poncho-like leaves. Later, the leaves will expand, and persist throughout summer. Caught in the act of unfolding, one of the first wood poppies, Stylophorum diphyllum, of spring nestles in a bed of poppy foliage. Later, perhaps even by the time you read this, the hillside where I made this photo will have exploded into a sea of luminescent orange-yellow poppy flowers, stopping passersby dead in their tracks. One of our most abundant spring wildflowers is yet another in the buttercup tribe, rue-anemone, Thalictrum thalictroides. Most flowers are stark white; others are a majestic shade of pinkish-purple. Back on March 12, I reported on a peculiar pink grasshopper found by Kristen Lauer. See that post HERE. From Kristen's photos, it appeared that the animal was a first stage instar; the earliest phase of growth. Grasshoppers, depending upon the species, apparently have between four and six instars, or growth stages. Their development is a simple metamorphosis - the young insects look essentially just like the adults, only smaller, and the wings are not fully developed. With each molt, the young grasshopper becomes larger and more developed. Anyway, I encouraged Kristen to keep the animal and stoke its appetite with iceberg lettuce or other tasty fare. 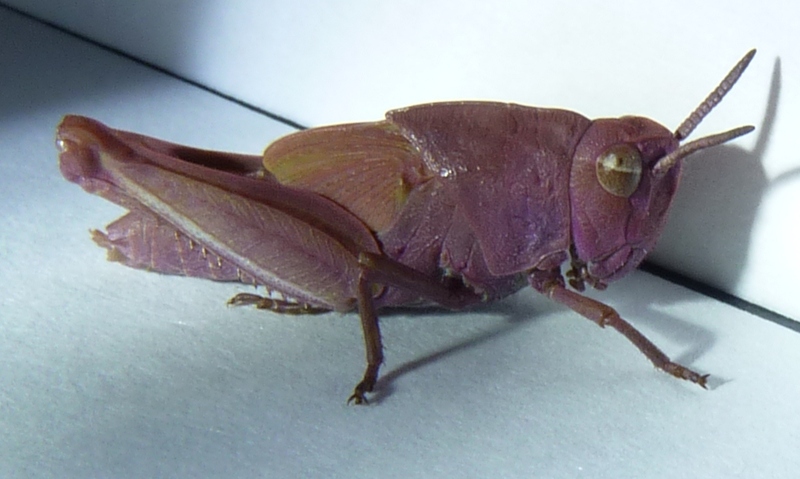 She's done an admirable job of raising the little pink hopper, and sent along the following photos today. As we can see, the insect has retained its pinkness following its first molt in captivity. It is now a bit bigger, wings are more fully developed, and it may even be a shade pinker. "The ridge through the grasshopper’s eye reminds me of another group, the band-winged grasshoppers. 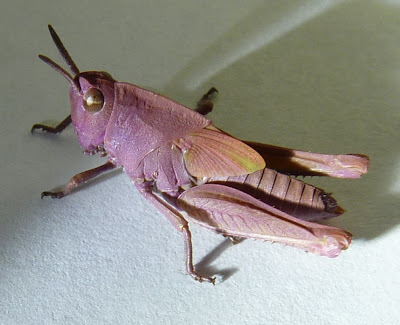 The earliest singing insect in northeast Illinois, the greenstriped grasshopper (Chortophaga viridifascitata) overwinters as nymphs and is displaying by late April or early May". With luck, all will go well for the little beast in captivity, and it'll continue through its various instars and eventually reach adulthood. It'll be interesting to see its shade of pinkness when fully developed. Thanks to Kristen for working with the animal, and providing this update. Golden Eagle attempts to whack Wild Turkey! Of the estimated 20,000 or so Golden Eagles breeding in North America, only a small number occur in the east. Tennessee and a few other states, I believe, have attempted hacking eagles into seemingly suitable mountain habitats, with unknown results. Whether reintroduction programs have helped or not, it does seem that the breeding population of Golden Eagles in eastern mountain states is increasing. That is one lucky turkey, and she may have set a world record land speed for the species in fleeing the eagle. To read the article about the resurgence of Golden Eagles in Tennessee, CLICK HERE. Yesterday was an absolutely delightful early spring day. Almost summery, really, with temperatures hitting 75 degrees in the southernmost reaches of Ohio. And that's where I went, hopping in the car at Oh-dark-30 and making the two hour drive to Adams and Scioto counties. These two counties harbor some of the greatest botanical diversity to be found north of the Ohio River, and with the unnaturally balmy weather of late, plants have been in eruption mode. I spent about nine hours in the field, and located scores of wildflowers, including some of our rarest species. My camera's clicker was busy recording nearly 1,000 images, some of which were keepers. I'll share some of those later. It seems that most of my field work anymore is in the company of others, which I greatly enjoy. I learn a lot from being with people who know more than I do, and getting another's perspective is always enriching. But I still love solo days, such as yesterday. Without any sort of distraction, I find my senses are heightened and I tend to notice lots of things that I might otherwise miss. When I'm by myself, I tend to move very quietly and the easing through the forest without making sound tends to allow one to better sneak up on the wildlife. Spot the mammal. It's right there, dead center, staring bullets at the camera. As always, you can click the photo to enlarge it and better see detail. While working a steep slope photographing the endangered goldenstar lily, Erythronium rostratum, I noticed a furtive movement out of the corner of my eye. Scanning the scene, I saw this bright-eyed eastern chipmunk, Tamias striatus, still as stone and peering though a forking branch from behind a rock. Mammals such as chipmunks and squirrels habituate well to suburbia, and become backyard extroverts. They adapt to the presence of people, and most of their natural predators are absent from the yardscape. In much wilder landscapes, such animals are often not nearly so confiding. At one point, while picking my way along a razorback ridge carpeted in oak and hickory, I noticed the blur of some large critter vanishing into the leaf litter. It was just a fleeting glimpse, and whatever it was was large enough that I wondered if it might be one of the smaller species of shrew. It wasn't. Carefully lifting the leaf that I though the animal vanished under revealed a telltale burrow about as big around as your thumb. It's right there, blending well with last year's litter of leaves, square in the center of the photo. Its occupant is right at the entrance, too. The flashing blur that I had seen turned out to be one of the giant burrow-dwelling species of wolf spider, perhaps one in the genus Hogna. As I peered into the depths of the burrow, I saw her legs slowly move into sight as she crept back to the entrance. A slight twitch by your narrator sent her scrambling back to the depths. So, I did what any decent spider enthusiast would do - I prostrated myself on the forest floor, camera at the ready, and hoped she might come out. Still and patient as I was - I lay in the leaves for a good twenty minutes - she would only come as far as the burrow's entrance, as seen in the photo. Any slight camera-adjusting move by me sent her instantly down the tube. I really wanted a good look, and decent photos, in order to learn her identity. Senora Wolf Spider would not be intimidated by smaller potential victims passing by her burrow. It's probably good that insects don't thought-process in the way we do. One can only imagine the horror that would register, albeit briefly, in the unfortunate bug's mind that bumbled into the vicinity of the spider's lair. In an incomprehensible blast of speed, the spider would rocket from the burrow, seize its victim, and bite it. Venom injected via a pair of impressive fangs would quickly incapacitate the prey, which would then be tugged underground where its soft innards would be sucked dry. Pink salamanders. I'm not kidding.